You're proud of your self-made guitar? 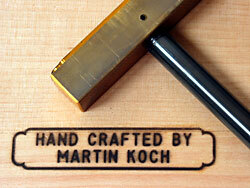 Why not document who's made it using a branding iron? Places for applying the brand mark could be the neck pocket or a pickup cavity of an electric guitar. The narrow branding iron model shown is especially suited for the back graft portion that is visible through the sound hole of an acoustic guitar. 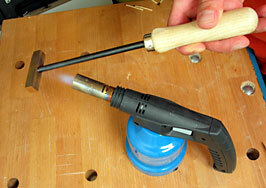 Heat the back of the iron for about one minute by moving it from side to side in the flame of a propane gas torch as shown above then burn the mark into the wood for about two to three seconds. Heat only long enough to produce a sharp, clean brand. Try on scrap to find the optimal times. You may have to rock the handle slightly to get a uniform mark from all letters. Branding irons are available in a variety of forms. The second line of the one shown can be choosen by you but there are also irons available with completly free choice of text. Even logos are possible. Also available are date attachements.